First Man flag row: How selective should Hollywood be with history? A new film about Neil Armstrong tells the story of how he became the first man to walk on the Moon. But, some argue, it isn't the full story. Ryan Gosling stars in First Man, which is directed by Damien Chazelle - the man behind Whiplash and La La Land. The movie, an early contender for awards season, explores Armstrong's personal journey and struggles as he attempts the feat. But it fails to show one rather crucial and memorable part of the quest - the planting of the American flag on the Moon. The flag is visible in the background in later shots, so it's more a case of downplaying its importance than actively changing history. In reality, when Armstrong and Buzz Aldrin unfurled the stars and stripes on the lunar surface less than 25 minutes after Armstrong's first small step in July 1969, watched live by hundreds of millions of people back on Earth, it was a symbolic moment. However, the decision not to show the event itself has sparked a row about whether the film-makers have deliberately played down America's superiority. "It did not fit in with their political agenda and, being liberals, they think that what actually happened, i.e history, isn't important and if it offends them it can be rewritten or simply expunged," wrote Rod Liddle in the Spectator. "Aside from anything else, this is cheating the moviegoers." He argues the US flag was a crucial part of the venture. "It was two fingers to the [Russians] and a reminder to the rest of the world that the US was the greatest country on Earth... it won the space race." You'd think a film which lasts for two hours and 15 minutes wouldn't have skipped any important details. But those involved with the film argue that the Moon landing wasn't solely an achievement for America - but for all of humanity. 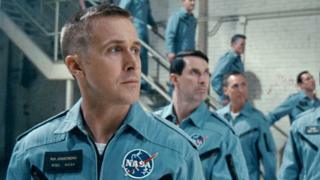 Gosling told The Telegraph the Moon landing "transcended countries and borders". "I think this was widely regarded in the end as a human achievement [and] that's how we chose to view it," he said. In a statement, Chazelle agreed: "To address the question of whether this was a political statement, the answer is no." Film-makers depicting real stories always have to decide which bits of history to show and which to skirt over - and First Man isn't the only movie to have grappled with the Moon landing. Comedy film The Dish, released in 2000, centred on the role the Parkes Observatory in Australia played in televising the event. Technicians there had the job of taking the images from the Moon and relaying them to the huge global audience. It may have been based on the Moon landing, but The Dish used fictional characters and, like First Man, also played around with some historical detail. "Everyone knows how the story ends so the most important details were the ones that recreated how it felt," its director Rob Sitch tells BBC News. Sitch recalls one particular thing they changed for the film - but, he adds, it's one that nobody objected to at the time. "There were three big dishes, not two. To make the story easier to understand we dropped the dish in Spain," he explains. "Even when the film was released there, it was never brought up in my interviews. A bit like in Australia, we suspected that it had been largely forgotten. "Some months later, we received an extremely gracious and complimentary letter from Neil Armstrong. At the end, in a warm way, he wondered how the people of Madrid felt about being left out. If he had a sense of perspective I think we should too!" Similarly, Armstrong's two sons have also defended First Man by saying they didn't see it as "anti-American in the slightest". "Of course, it celebrates an American achievement," they said in a statement. "It also celebrates an achievement 'for all mankind,' as it says on the plaque Neil and Buzz [Aldrin] left on the Moon." However, Aldrin appeared to voice his distaste of First Man's flag-planting omission - albeit in a less direct way. Last month, he tweeted a picture of himself and Armstrong on the moon with the flag, captioned with the hashtag "#ProudToBeAnAmerican". Former Republican presidential candidates in the US also criticised the editing. Marco Rubio said it was "total lunacy", while Ted Cruz added that it was "wrong, and consistent with Leftists' disrespecting the flag and denying American exceptionalism". But is it really an insult to Americanism? Sitch thinks that criticism "feels like misguided insecurity". "You even mention Apollo 11 and you think of America at its best," he says. "If you watch the whole [original] recording of the astronauts, the flag-planting comes well after the first footsteps and as a formality. In a sense, the triumph of the achievement swamped everything, even the live call to the president. "People all over the world were in awe of what America had just achieved. If you think the planting of the flag was the key emotional moment, you're probably missing the point." As for the suggestion that directors shouldn't take artistic licence with historical fact, Sitch argues it's sometimes necessary in order to tell a story within the constraints of film. "You've got two hours to get to the essence of a multi-decade hugely complex history-making enterprise," he says. "That's why artistic licence was invented. You're trying to recreate how the key moments felt."